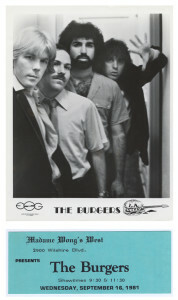 Years before my music career took on the on a softer-jazzier music style one of the Pop type bands I was a member of in the early 1980’s was group called, The Burgers. This group encompassed everything I loved about rock, pop, jazz and fusion. Guitarist David Nielsen was someone I considered a genius. His guitar playing could rival that of John McLaughlin’s best, but his rock sense was from the New-Wave movement and his songwriting-vocal performances was what was happening at the time. Together with Ed Cohen and Craig Mesco on drums, we played throughout the Los Angles area, building a following and attracting label interest. We recorded quite a bit at the Pasha Music House on Melrose in the Larchmont/Hollywood area, and received local airplay from radio station KROQ. Here is albums sample worth of material from the Burgers for you to listen too that takes me back to a much younger period in my life.